A coffee table book looks at his creative process, which included work for Stanley Kubrick and Clint Eastwood films. Bill Gold was just 21 and a recent graduate in illustration and design from the Pratt Institute in New York when he was hired in the advertising department of Warner Bros. in New York City. His first poster was for the 1942 classic "Casablanca." Over the next 60 years, Gold was responsible for either designing or working with illustrators on about 2,000 motion pictures, including Elia Kazan's 1951 "A Streetcar Named Desire" and 1955's "East of Eden," Alfred Hitchcock's 1954 "Dial M for Murder," Stanley Kubrick's 1971 "A Clockwork Orange" and 1975's "Barry Lyndon," and 35 Clint Eastwood movies. 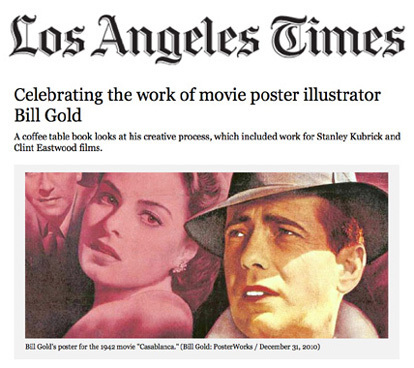 Gold, who turns 90 on Monday, is the subject of a lavish limited-edition coffee table book, "Bill Gold: PosterWorks," from Reel Art Press. Only 1,500 copies are available; it weighs 16 1/2 pounds and costs $650. It examines Gold's creative process and features his collection of unseen designs, alternative versions, sketches, drafts, notes, photographs and a treasure trove of iconic movie posters. The illustrator talked about his craft over the phone from his home in Connecticut. As creative director of posters at Warner Bros., you designed some posters but also farmed some out to such illustrators as Bob Peak. Would you talk a bit about that process? If I wanted to use Peak or another illustrator, I would give them a design idea. I would sometimes give them a sketch. For instance, in the case of "Camelot," I would say to Bob, "I want you to do something in a Gustav Klimt design like 'The Kiss.' I would do a scribble sketch on a piece of paper where I would show him the outside area of where I wanted him to put the montage — in other words, form a frame of montage and in the center I would want him to do the likeness of the two stars and then the clinch. I almost described the layout to him and then, of course, I asked him to come up with ideas. He would bring me many suggestions of what he wanted to put in it. How did your relationship with Clint Eastwood begin? I was lucky enough to get to work with him in 1971. I was introduced to him by one of the managers at Warner Bros. Clint said, "I would love you to do a campaign for me on 'Dirty Harry.'" When I delivered the campaign for him a couple of weeks later … he said, "Don't change a thing." All the way to "Mystic River." I did every one of his films, whether he did it for another company or Warner Bros. If he was doing it for Columbia, he would get me to start on it with Columbia. What was Kubrick like to collaborate with on "Clockwork" and "Barry Lyndon"? Kubrick was phenomenal. He never left London. He wouldn't come to the States, but I would go to him. I stayed at his house for a couple of weeks on "Clockwork Orange." I worked on many sketches for him. Many times I went back to New York and sent him more stuff. As it turned out, he had an artist in London that he liked very much, Philip Castle, and he asked him to do an illustration. Kubrick loved it, and I loved it, and we put it into the campaign. We devised a bunch of copy about the type of characters and how they loved Beethoven and how they were violent. What do you feel about the quality of movie posters today? I am so upset with them. I am so depressed. Since I have left the business … they no longer use illustrations. They just have a young art director sitting with a Mac computer and he puts a couple of heads into the screen and he moves them around and puts the lettering down, and that's the poster. I never would present a campaign to illustrate a movie that simplified and that silly.